Before closing out the summer... Copenhagen! Before my time at Great Northern ran too short, I decided to take a little day trip to Copenhagen City, the capital of Denmark. I dragged my buddy, Jack Darling, to Copenhagen so he could see the city as well… and he had a car, so I saved money by not buying a train ticket! To get to Copenhagen, we had to cross the Storebælt Bridge, also known as the Great Belt Fixed Link Bridge. This 6,790-meter-long bridge connects the two islands Zealand and Funen (the island Great Northern is on). It opened in 1998 after a costly price of 21 billion Krone (~3.5 billion USD), and you’re charged 240 Krone (~38 USD) to cross the bridge each way! Headed toward Copenhagen. Don’t be nervous to visit Copenhagen, because no matter where you’re from, chances are you’ll have an embassy to visit if needed! Copenhagen holds embassies for 74 different foreign countries. The Swedish Embassy, one of many within the city. Photo taken out the car window. We drove into the north side of Copenhagen to see the Little Mermaid Statue, based on the story written by Danish author Hans Christian Andersen. It was built in 1913. Sitting at the water’s edge, the Little Mermaid attracts thousands of tourists each day. On the way to the most famous palace, we walked past the Christiansborg Palace. This is home to the offices of Danish Parliament, Supreme Court, and the Prime Minister. Construction began in 1733. A view from the front courtyard. Then we made it to the big Amalienborg Palace, which is a home for the Danish Royal family. Its split into 4 different classic-style palaces around a courtyard. Each of the 4 palaces is named after a previous King. This was built in 1760. In the courtyard, you can find the Royal Life Guards. They patrol the palace grounds day and night. Super serious. Copenhagen has tons of statues to pay tribute to deceased historical/political figures. This is King Christian the 10th. He was King from 1912 to 1947. Many statues of different previous Kings stand on blocks all around the city. Close to the Christian X statue, you can find “Nyhavn” (pronounced New-Hown), which means New Harbor. This waterfront district of Copenhagen was established in the 17th-century. The oldest house in Nyhavn was built in 1681. Looking good in my TurfNet hat, probably the first one ever in Copenhagen! Make sure to plan your trips with lots of detail and preparation… you may end up lost like old Spidey here! Our final destination was Tivoli Gardens, the 2nd oldest functional amusement park in the world and gardens that opened in 1843. On average, Tivoli Gardens receives over 4 million visitors per year. There’s several different roller coasters and tons of booths with carnival-style games and cuisines from many foreign countries. The “Daemon” towered over us as we first walked in. There are a few different dropping towers, swinging rides, and more all over the park. I managed to convince Jack to try the Demon coaster with me, and it was great! Going up the Demon! Although it may be scary to some, the views from the top of the Demon are great. Jack and I enjoying a simple cheeseburger in Tivoli Gardens. Thank goodness we ate after the Demon! Copenhagen was a blast, however, Jack and I could only visit for a few hours on a Sunday. Personally, I’d suggest visiting Copenhagen over an entire weekend, so you can really experience the city and appreciate the crazy new and old architecture up and down every block… and also spend a full day at Tivoli Gardens of course! I want to visit Copenhagen again, and I’m sure Jack would agree with me on that! It’s safe to say that majority of golf courses around the world have a driving range on property, and this is responsibility for the greenkeeping staff and proshop staff to maintain. It’s very common for the clubhouse/proshop workers to collect the range balls to be reused and allow the greenkeepers to maintain the turf on the range. Here at Great Northern Golf Club, we have a high-tech GPS-based robotic system that can do both! I met up with our club Head Pro, Søren Hansen, to take a look at the part of the system that sits inside our driving-range/proshop facility. Søren checking out a few range balls. Søren joined the European tour in 1997 and proceeded to win 3 events. He was included in the top 50 professional golfers in the Official World Golf Rankings and was labeled as the best Danish Golfer in 2007… and he’s our Head Pro! I’m very glad to have met Søren, he’s an awesome guy. Thanks for showing me the system! Søren has lots of work to do including giving lessons, proshop business, and more, so he and the other workers don’t have too much time to spare to pick range balls. Therefore, the ball collection system is a perfect fit for Great Northern. Several companies were contracted to put together the mowing and range ball collection system using robots, underground piping, and vacuum systems to handle the aggravating job of driving a cart up and down the range and getting smacked with range balls hit by golfers! The interior portion of the system includes the vacuum, a pump for the vacuum, a collection tray for hand-picked balls, the computer system, and the big steel container that feeds the balls to pipes to be dispersed to the outside ball machines. The inside portion of the system. The tray for loading hand-picked balls. Here is where the balls can be split between the two separate dispensers for the customers. Inside one of the dispensers. The balls are brought up by the flaps of the conveyor system. BelRobotics makes the Bigmow and Ballpicker electric-powered robots that are programmed to mow the rough of the range and collect the balls to be dumped into the designated collection pits. These robots have a width of a meter and can really get the job done! A Bigmow putting in some work. The Ballpicker and Bigmow from Belrobotics. At these pits, the collection robots can empty their loads of around 250 balls and grab a quick charge to keep moving throughout the day. The mowing robots aren't programmed to go to a collection pit, therefore they have their own charging stations off to the side of the pit. Buried around the perimeter of our 5-acre driving range, lies a cable 30cm under the surface so the robots can sense where they are needed to mow or collect. Our driving range. Even though the robots aren’t too big, with a couple working at a time, they can cover the 5 acres in a little over 24 hours. 5 acres is a lot of ground to cover for a tiny robot, however, the robot can cover the whole area on one full charge. If your driving range aggravates you with the ball picking and extra mowing, take a look at going high-tech! Another big thanks to my co-worker, Jack Darling, for helping explain the system to me. First things first. I am an awful cook. I belong on the opposite side of Gordon Ramsey and Paula Deen on the spectrum of the culinary arts. Upon leaving the U.S.A., I realized that my easy days of running to a McDonalds or Chick Fil A for a meal were coming to an end. Within the first couple of weeks, I struggled to feed myself, because I never learned how to cook. I had gotten so spoiled with fast-food and my parents feeding me. I’m embarrassed to say, I may have only used a stove top a couple dozen times before coming to Denmark. But I had to start to feed my raging American appetite. Over the past 3 months of traveling around, I’ve run across many different cultures. A very important component to cultures are the different foods within. I live in a house with greenkeepers that come from many different countries. Scotland, Ireland, England, Lithuania, Bulgaria, Latvia, and Poland are all homes to the dozen or more greenkeepers living in the housing complex. Therefore, I get a little experience from several different countries every single day. Lithuanian, Scottish, Irish, English, and American all in one picture! During my trip to Scotland, my friends, Grant, Jack and Scott, who grew up there insisted I try a few of their favorite foods and drinks. Of course I had to try the hot tea with milk. The most requested items from the guys were Haggis and Black Pudding. When I say Black Pudding, many people may think of a gooey delicious snack, however, it’s actually a “blood sausage” made from pork blood, pork fat, oatmeal, and a few more small ingredients. I will say that I am not a fan of either of the two. Black pudding is usually paired with this sweet “brown sauce” Haggis is another style of “pudding”, but doesn’t come in a sausage form. It’s made from Sheep’s Pluck, which can contain the heart, lungs, liver, and other organs that are normally disposed of. The Scottish people enjoy these traditional foods, because a long time ago before meats were easily available, the Scots would try to use as much of an animal for food as possible to avoid wasting meat. 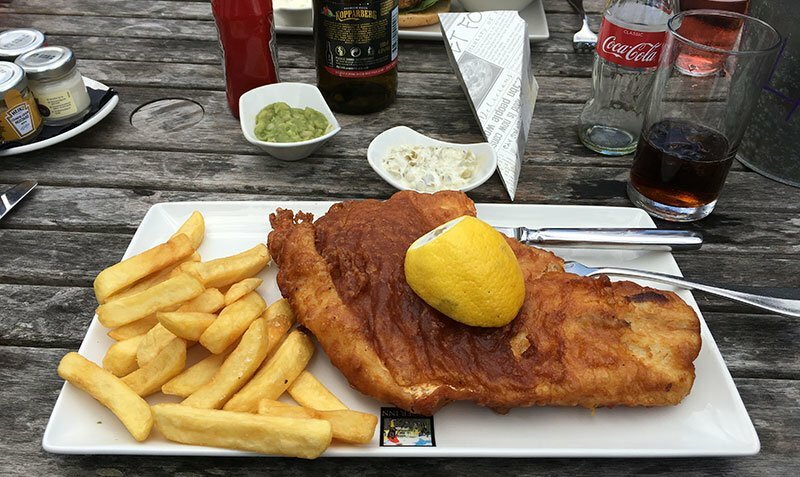 Along with Scotland, majority of the United Kingdom is pretty crazy over fish and chips. This usually consists of fried cod and French fries. Yum! My Bulgarian house-mate Michail introduced me to Bulgarian cuisine. He made “Musaka”, which consists of mince meat, tomatoes, onions, Bulgarian spices, eggs, yogurt and potatoes. In the process of cooking. Ready to eat! Thanks Michail! I thought to myself that since I’m trying foods from different cultures, I should introduce my friends to a typical American meal. A cheeseburger and French fries would’ve been too stereotypical. After the Europeans joked around with me about drinking Coca Cola (typical American), I decided to make my family’s staple Coca Cola Chicken. The simple recipe of Coca Cola, ketchup, honey, and chicken had a few of the guys foaming at the mouth! English Jack, Irish Jack, and Irish John chowing down on a taste of America. I’m a pretty picky eater, but I enjoyed broadening my horizons in the culinary world. Not everything you try will satisfy your taste, but you’ll never know if you like it without giving it a go. I don’t mean to imply that I dislike irrigation by titling this blog “Irrigation Irritation.” In fact, I love irrigation. I was introduced to the turf industry at the age of 16 when I helped install an HDPE system at Mountain Lake Country Club in Lake Wales, Florida. 16 year old Parker getting after it on the skidsteer! Here’s me plowing some 6-inch mainline back in 2015. Here at Great Northern, we have a Rain Bird HDPE system. The entire system is high-quality, and the pump house is pretty cool! Interesting pump house design, might withstand nuclear fallout! We have 5 30-kilowatt electric pumps and a jockey pump that’s around 20-kilowatts. Shiny new pumps running at 30 kilowatts each. That’s 150,000 watts total, excluding the smaller jockey pump. I say “Irrigation Irritation” because of the water quality that is used for irrigation at Great Northern. The pH of the water we pump from the lakes around the course is around 9.0. Creeping Bentgrass, like our tees and greens, prefers a soil pH of around 6.5 (6.0-7.0), therefore the 9.0 pH water we use would be detrimental to the various turf surfaces. To combat this issue, we utilize an Acid Injection System. The water sure is pretty, but not good for the turf. This system analyzes the current pH of the water along with how much water is being pumped through, then shoots little bursts of acid in the mainline to adjust the pH of the water being used. The pump for the acid. We pump a water amendment with Sulfuric Acid (pH of 1.0), which makes up about half the weight of the product, into our mainline to regulate the water pH to a neutral 7.0. The pump for the acid. The product we use is made by Plant Food Company, and it comes in 1000-liter containers. It’s a 15-0-0 liquid fertilizer with 16 percent sulfur. Sulfur is great for lowering your soil pH. I give all the credit to the master of irrigation, Michail Trivonow, from Bulgaria. He’s shown me the ins and outs of the irrigation system, and I’ve been running hose with him recently here at Great Northern. Michail getting ready to handwater 14 green. Water management is arguably one of the most important skills for a turf manager to possess. When it comes to water management, I have learned to address the issues at hand, take my time, and do it properly. I had worked six professional tournaments before adding the recent Scottish Open as number 7. Of them, the Scottish is definitely at the top of my list. The event was held at Gullane (pronounced Gull'-in) Golf Club on the southern shore of the Firth of Forth in East Lothian, on the east coast of Scotland. Planted right along the North Sea, the golf course sat upon cliffs overhanging beautiful native landscapes and rocky shores. Gullane Golf Club is home to great links golf, great people, and breathtaking views. Here, a cool view of number 8, the par 3, at Gullane. Coming from Myrtle Beach, I had never seen cliffs like those at Gullane. Many of the tournaments I’ve worked have been really high energy events, so I’m always really pumped up before our shifts that usually take place around 5am. The Scottish Open didn’t quite have the same crazy energy, however. Every morning I was assigned to mow fairways with Kevin from the greenkeepers crew. Kevin fueling up his Toro 7-plex fairway unit, a very efficient machine that cut a lot of grass. 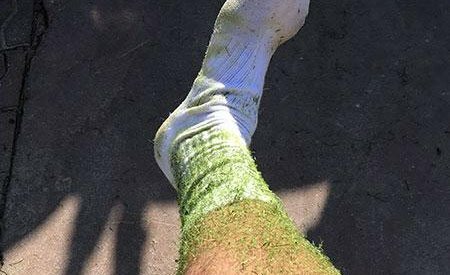 In the evenings, I was either put on the divot crew, or did a different special job. 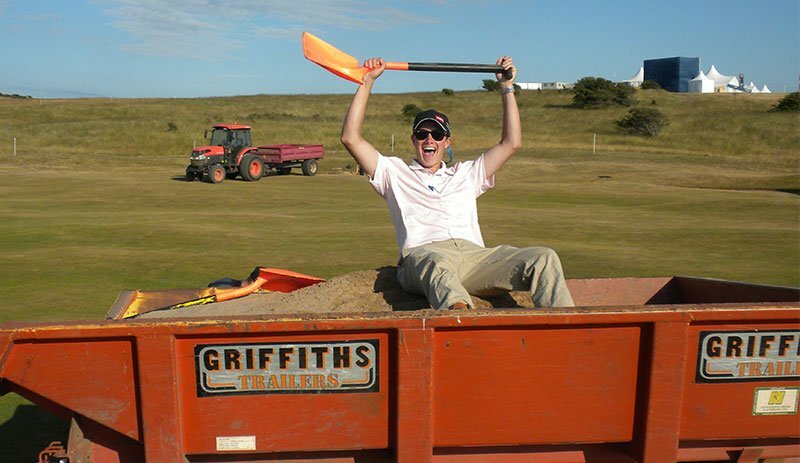 One evening, I helped the crew replace the light and loose sand in bunkers with sand that compacted easier to withstand the crazy Scottish winds. The old sand (l) wouldn't compact very well. The new sand (r), with a little added moisture, worked perfectly. Blair Shearer (L) and Dave Thompson, ready to replace sand. Blair and Dave getting after it in the bunkers! Call me the sand man! Another job I did was pulling Ragwort, also known as Stinking Willie, from native areas. This needed to be done for aesthetic and safety purposes. Ragwort control is necessary because wild animals’ digestive systems can’t break down the weed. Ragwort, looks similar to Dandelion, but smells and looks worse. At night I would hang out with my new friends. Everyone had a good sense of humor, and they were all very kind. Ashley posing with his “soft” lotion that Gary Innes bought him, because Gary thinks Ashley has softy American hands! Me, Ashley, Dave Angus, Gary Innes, and Baptiste Traineau in the restaurant of the bed and breakfast we stayed in. Come the end of the tournament, I wasn’t ready to go home or aching to be in my own bed. The relationships I had started with the other volunteers and crew members made me enjoy this tournament so much. Even after I returned to Denmark, some of the crew members, Kevin West and Liam Nicholson, have been on video chat with me for a good laugh and to catch up. After a great week with everyone, I hated to have to leave. Hopefully I can make it back to Gullane another year for another tournament! Head Greenkeeper, Stewart Duff, saying farewell. I’m going to miss the guys, I hope to see them again someday. A little golf trip never hurt anyone. Since my TurfNet internship this summer includes an opportunity to volunteer at the Scottish Open at Gullane Golf Club, my parents decided to fly to Scotland to visit me, have a short vacation and enjoy a little golf as well. They met me in St. Andrews the weekend before the Open. I arrived in St. Andrews on Friday night and got a chance to play the Old Course on Saturday morning, before my parents' arrival. This was made possible by Gordon Moir, the Director of Greenkeeping at St. Andrews, who guided me through the ballot/waitlist process there. My round at the Old Course, which was built in 1552, was my favorite round of golf, ever. I was paired with three new friends, John Conway, Hicks Layton and Billy Teichman, and shot an 85... which I was quite content with after not playing golf for a good while. The entire course, greens to tees, has crazy undulations that can take your ball to just about anywhere, even when you don’t expect it. View off the 18th tee at the Old Course. The picture doesn't do it justice, but the elevation changes can be taller than the average person! My new friends I played the Old Course with. (l-r, John Conway, Hicks Layton, and Billy Teichman) Gordon Moir (l), Director of Greenkeeping at St. Andrews, with the Claret Jug from the 2010 Open Championship My parents arrived on Saturday, and we had a nice meal at Forgan's, a "local knowledge" recommendation from a friend and co-worker at Great Northern in Denmark. My mom, Tracy, and step-father Ashley Wilkinson (who also is department chairman of the turf program at Horry-Georgetown) On Sunday morning I played the New Course with my step-father. The New Course is a Tom Morris design that was built in 1895. Ash-man lining up a putt for par. I whooped Ashley with a 79! But 82 isn’t half bad for the old man. St. Andrews is an amazing little town on the coast of the North Sea and is home to the truest links golf there is. Many hole locations have views of the North Sea, but a lot of views are blocked by the big dunes the course is built on. Views don’t get much better than this. Playing the Old and New Course at St. Andrews was a dream come true, and it couldn’t have been done without the help of Mr. Gordon Moir, TOCA, TurfNet, Bayer, and my parents. A quick photo op on the Swilcan bridge. It’s the quickest route for the golfers to cross the Swilcan burn. The World Cup is one of the biggest sporting events there is. Whether you're a European "football" fan or an American "soccer" fan, chances are that you're looking forward to The World Cup... one of the most watched events worldwide. My mentor/superintendent this summer, Aidan O'Hara, supervised the construction and renovation of football pitches that were done for the 2010 FIFA World Cup in Johannesburg and Pretoria, South Africa. There was a panic with 22 Team Base Camps (football pitches that the teams practice at) being prepared too slowly, so Aidan was hired to take control of the situation 100 days before the World Cup. These pitches were contaminated with Kikuyu grass, which is a very dense and competitive turfgrass. Fun fact: The warm-season Kikuyu turfgrass can produce herbicidal secretions to successfully out-compete surrounding turfgrasses. After enjoying his experiences with the 2010 FIFA World Cup, Aidan decided to do the same kind of work for the UEFA Euro 2016. He worked on an Austrian team base camp that was falling behind schedule, only 8 weeks before the event. Aidan turned all the failed turf around with lots of hard work and attention. Not only did he supervise these pitches, he also did some of the labor himself. He did fertilizer applications, mowing, and more to give his best effort to the pitches. Aidan really enjoyed the sports-turf work, so he said, "A football pitch is just a small rectangular fairway, so I enjoyed the step away from the golf side." The perennial ryegrass pitches were mowed at 25mm so were nothing Aidan wasn't familiar with. Aidan O'Hara with me at Great Northern. Aidan told me, "The newer pitches weren't quite ready they would wear easily in the high traffic spots like penalty kicks and so on." With years of golf course work and World Cup experience under his belt, Aidan has easily impressed me with the wisdom that I've seen working first-hand with him. He was listed as one of The 50 Most Influential People in Irish Golf. Both Nick Faldo and Tiger Woods have shown great interest in Aidan's work. In 1993, the Irish Open was held at Mt. Juliet, Aidans course at the time, and after experiencing how the putting surfaces rolled, Nick Faldo said "[Aidans greens] are the best I've played on in Europe this year." Pesticide, fertility and chemical applications on golf course putting surfaces are easily one of the most important tasks performed in golf course maintenance. Precision, attention to detail, and alertness are extremely critical for these applications. Here at Great Northern we use two Hahn Spray Bugs for applications to our greens. The Hahn Spray Bug is an electric-powered sprayhawk produced by Hahn Application Products, LLC in Evansville, Indiana. The sprayer has a 15 gallon tank, 80 inch covered boom, and is powered by two large batteries. Using the Spray Bug eliminates compaction created by driving a full and heavy spray vehicle across the most valuable turf surface on property. "The American" in action with a Hahn Spray Bug. The Hahn Spray Bugs in our fertilizer/spray room. A full 200-300 gallon sprayer can weigh over 3,500 pounds! 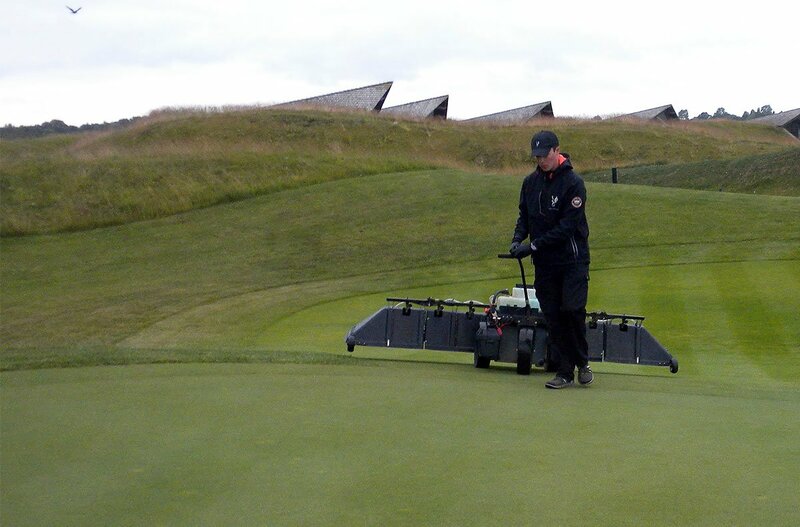 This sprayer serves as a nurse vehicle for the Spray Bugs and stays off the green surfaces. The Spray Bug is controlled by the trigger and switch at the end of the steering arm, it can be refilled easily, and doesn't need to be tethered to any spray vehicle during an application. This makes the job easier by eliminating more things to worry about. This handle houses the trigger for forward/reverse motion and the switch to release the product through the nozzles. Spray applications are pretty simple when using the Spray Bug. Our pre-application check list includes: Make sure you have fully charged batteries. Adjust the main sprayers pressure to match your desired spray rate. Check the pressure of the Hahn Spray Bug. Make sure the forward, reverse, spray switch, and trigger are operational. Inspect all of the nozzles. Pre-mix your solution in the side-mounted pre-mixer on the spray vehicle. Fill the Spray Bug to be ready for use. The pressure gauge on the Spray Bug (measured in bars, not PSI) View of the underside of the covered spray boom. Initial filling of the Spray Bugs from the sprayer. The charging station for the Spray Bug batteries. On our Maintenance Monday (2 hour longer work day), Benny Christoffersen showed me how to make a proper application using the shown equipment. We sprayed TourTurf Bio Active Plus, a fertilizer and microorganism product, on all of the putting surfaces on property. After converting my Imperial measurements to the Metric system measurements, I was able to fill out this spray log to complete the day. The spray log: gallons to liters and acres to hectares this isn't normal for the American boy. With this training in hand, I am now confident enough to use any sprayhawk or the Spray Bug solo. By using alternative products and management strategies, a great turf manager can find ways to manage world-class turfgrass with minimal crop protectants... like the broad selection that is accessible in America. Here at Great Northern, head greenkeeper Aidan O'Hara uses beneficial microorganisms in his preventative fungicide plan. Microbes and soil pH are two of Aidan's many strategies for managing turf diseases. Only three fungicides are legal to use in Denmark as of June 2018: The legal pesticides for Denmark (that I know of). Aidan had me apply TourTurf Bio Active Plus one morning. This product contains 3% nitrogen, 6% potassium, 10% seaweed, 22 amino acids, and a whole bunch of good microorganisms. The TourTurf Bio Active Plus jug. I had to do a little research on the product, because theres no way Im reading this Danish label! 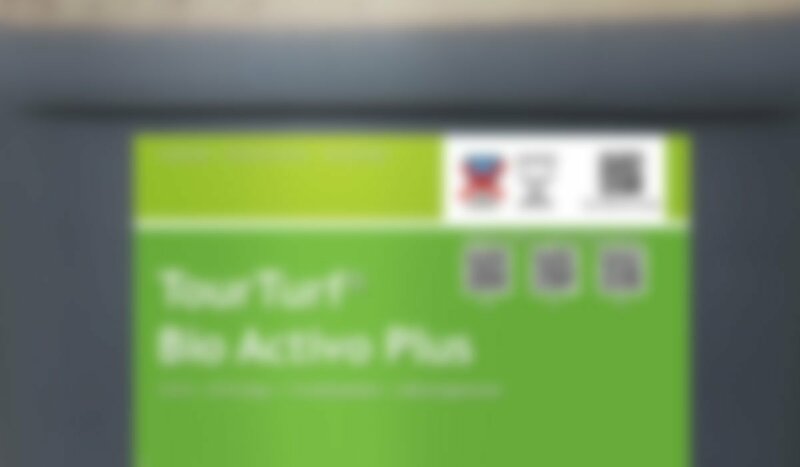 Listed below are the different microbes/microorganisms in TourTurf Bioactive Plus and their purposes: Bacillus subtilis: Produces cell elongating auxins (growth stimulators), solubilizes phosphates (good for disease resistance), and helps to protects the roots. Bacillus licheniformis: Provides better stress tolerance for the plant, and eats away at the organic thatch mat layer. Bacillus amyloliquefaciens: Helps with disease resistance, and prevents saline/salt and drought stress. Bacillus pumilus: Helps with resistance to the diseases Rhizoctonia and Fusarium. As an American turf manager would spray a fungicide such as Flutolanil (active ingredient in products like ProStar), here in Denmark we regularly use microorganisms to help prevent fungi. The ProStar jug. (Shoutout to my sponsor Bayer Golf!) With a very narrow selection of fungicides to use, including beneficial microbes in your Integrated Pest Management Program is the way to go! I was glad to be using a John Deere sprayer Im comfortable with. This spray application opened my eyes to using other management strategies for fungi control, and I hope other aspiring greenkeepers are now influenced to learn more about these different methods. Hi everyone! I'm Parker and I'll be your tour guide for today. Today we're taking a little trip to downtown Kerteminde, a normally quiet little town on the island of Funen in southern Denmark. It's my home for the summer. View of Kerteminde from the north beach. During the summer months, Kerteminde attracts lots of visitors. The town has a beautiful harbor, clear water beaches, great local restaurants and various events for everyone to enjoy. I took a quick trip into town and stopped by the beach and found a bunch of youth soccer games going on. The games drew a pretty decent sized crowd. Along with the beach soccer courts, there were some volleyball nets for anyone to get in some fun exercise. Volleyball and soccer area for the locals to have some fun. As you can see, sweaters and jackets were the order of the day. Some areas of the beaches are quite rocky, but the areas farther into town are pretty soft. Down by the beach, there's a little putt-putt golf course for families to enjoy and grab an ice cream cone on a nice summer day. Not quite the Nicklaus design at Great Northern, but still fun for families to spend time outside. Walking farther into town, we pass the Kerteminde Kommune. This is their city hall, which is where I had to apply for my 3-month residence permit. The city hall, where Kerteminde's governmental business takes place. Beside the Kommune is the Superbrugsen, which is similar to a mini-Walmart. Most of the locals go here to purchase their groceries and other basic items you can find in a supermarket. Anything I need, within a 5 minute bike ride. After walking past the Kommune and Superbrugsen, we can get a better look at the harbor. Kerteminde is known for being a fishing village, but there are lots of pleasure craft around. The harbor is full of boats and freezing cold water. Given the fact that Kerteminde brings in a good heap of fish, you can also imagine that there's a good bit of fish restaurants. A good one downtown is Rudolf Mathis Fiskerestaurant. It's located along a cool little outlet right in the middle of town. Nice little local joint on the water. After grabbing a bite to eat, people enjoy walking around town to see the beautiful architecture of the buildings, homes, and the old-fashioned cobblestone/brick streets. Interesting buildings, structures, and roads. When walking downtown, you may stumble across this local ice cream shop. The local ice cream has my approval! Tourists enjoy grabbing an ice cream here and sitting down by the outlet where the locals kayak and the kids jump off the downtown bridge. I saw kids jump in the Scandinavian freezing cold water, but this southern boy is gonna stay dry! Getting acquainted and comfortable... no problem! Settling into a different country has been pretty easy for me. Thanks to my new friends who live at the employee housing and in various flats nearby, I've had a great deal of fun. The Greenkeeper house, my home away from home. Our greenkeeping crew has guys from many different countries, including Lithuania, Latvia, Scotland, Ireland, England, Denmark, Australia, Poland, and more. Many of these international employees have worked in several different countries such as Sweden or the Netherlands before coming to Great Northern. The crew before the 5am morning meeting. Everyone here understands how uncomfortable it can be to leave home and settle down in a foreign country, therefore, everyone has been very friendly and helpful since my arrival. Whether the other Greenkeepers have been nice or friendly jokesters, it's been great having them around. Jokester Jack Smillie (right) messing around with Jack Darling during our lunch in Odense. Being an American, I'm used to using microwaves and buying fast food to combat my hunger when my parents aren't there to make a home-cooked dinner for me. Cooking has been quite the hassle for the few weeks I've been in Denmark... and the closest McDonald's is 30 minutes away! I'll have to travel to Odense or Nyborg if I want the easy and very typical American fast-food meal. Although cooking has been a little difficult, a few of the guys who live with me have shown me a few tips and tricks to get by. During the first couple of weekends I was in town, my new friends spent time showing me around the towns and getting to know me by having cook outs, hanging out, and playing games. Grilling some steaks, sausages, and more in Scott Dmuirs backyard. One day several of the crew members took me to the beach in Kerteminde to play a friendly game of volleyball. Volleyball on the beach at Kerteminde. Vadims Arakejevs, one of our greenkeepers from Latvia, built a makeshift ping pong table out of a picnic table and some plywood to have an extra game at the house for passing the time. Handyman Vadims with his top-of-the-line ping pong table. Not only have my new friends invited me to play sports and relax at cookouts, but they've also invited me to tag along to Odense. Odense is the 3rd largest city in Denmark and is home to around 200,000 residents. The downtown areas are always very busy and attract many tourists with the different pubs, stores, restaurants, and more things it has to offer. The streets of Odense have amazing architecture and small touches of design from different countries all around Europe. Dave, Jack D., and Jack S. strolling down the streets of Odense with me. A bunch of the guys grabbing a bite to eat at Café Siesta in Odense. This past week at Great Northern, the talk was all about the aerification and topdressing we've been doing. After a long couple of days of hollow-tining greens, the crew worked really hard all day and got a few essential things done for post-aerification. A few of the guys were sent out to push-spread Greenmaster Pro Lite 14-5-10 fertilizer with some magnesium. Magnesium is just as essential as nitrogen for turfgrass to produce the chlorophyll molecule. John Cunningham, from Ireland, wrapping up his final pass on #17 green. A quick snap of the product they applied. A light topdress was applied to a decent portion of the golf course this first week. Greens, fairways, and foregreens (a European term for the approaches) all received some sand. Here's one of the crew members loading fairway sand into a TyCrop, an earlier brandname for the Toro MH-400, to be spread. After hollow-tining the greens, 30 "tonnes" of sand was applied. Europeans use the metric system rather than the Imperial system that Americans use, therefore, if we used the Imperial system in Denmark, I'd say around 66,000 pounds of topdressing material was applied. The Dakota Turf Tender 310 that we use to topdress greens. 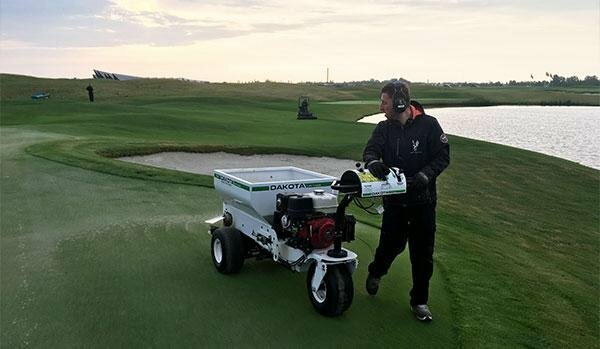 Head Greenkeeper, Aidan O'Hara, told me, "The sand we used was approved by Thomas Turf Lab in the U.S., which was the best match to be compatible with our root zone." The Thomas Turf Lab approved topdressing sand. Aidan is very big on topdressing at Great Northern. Once Aidan inherited a large thatch layer with his position as Head Greenkeeper, he decided his mission was to remove and dilute as much thatch as possible. Soil profile from 2012. Lots of thatch! Aidan and I examined profiles on our 12th green and found that his cultural plans are improving the soil quality. Hours upon hours of hollow coring have broken through the thick layer of organic matter that has accumulated on our greens. Here you can really see the penetration from the hollow tines and the amount of topdressing Aidan has applied over the period of just a year. Red: Hollow tine penetration. Blue: Organic mat layer. Yellow: Topdressing applications With lots of topdressing material going out, the outsourced mechanic, Tom, has to do lots of grinding. Luckily, Tom gets to use a great Foley Accu-Master grinder. Tom and I checking out the grinder. After lots of hard work from everyone on staff, it's safe to say we're lookin' good! I got to walk away from this week with the confidence to use a Toro/"TyCrop" material handler, a GiANT loader, and a Dakota Turf Tender 310. My new friend, John, was helpful in teaching me how he does a topdress application, and thanks to him, I am confident that I too can take on this job alone. John wrapping up #2 on our 9 hole Academy course. My official first day of work at Great Northern was Tuesday, May 15th. The first few days that I was in Denmark prior to that got a little boring, considering I had no way of getting around town except walking, and I was eager to get to work. The solution for me was to help out over the weekend before my official start date, so I jumped in with the aerification crew late one evening. I shoveled the cores until 9:00 that night, which isn't as bad as it sounds because the sun sets at 9:30! Clean green after I volunteered to help shovel cores before my "official" start. I'm glad I can finally start working as have been waiting several months to get here. My first official days of work were spent mowing tee surrounds with a rotary push mower, and fly-mowing bunker faces the next few. These job assignments may sound a little tedious, but they are a few of the many things we do at Great Northern that makes it a world-class golf course, so I'm glad to do it. A couple of my co-workers informed me that growth regulators are restricted for turf in Denmark, so we have to mow everything pretty frequently. With no PGRs labeled for turf in Denmark, there's plenty of grass around. On the first day I was partnered with Dave Dusch, who was born and raised in Australia. Dave grew up to be a musician, but he works at Great Northern now. Dave told me, "I love the fresh air, and every day there's something different to do." Dave, with a few holes on the front nine in the background. After a few days of working and showcasing my work ethic, the supervisors allowed me to cut cups and mow fairways. Cutting cups is fairly easy here, because we use a depth gauge and foot board to cut the same depth hole for every day on every green. This job has been my favorite so far because I get to see every hole from tee to green each morning. Placing the pin in a difficult position for a tournament on the 15th green. Each day at work is great, then after work I get to wind down and relax in my own mini-apartment. Most housing accommodations given to interns, that I have heard of, are very simple rooms that are often shared between a couple of employees. In this case, Great Northern provides me with a room that includes a bed, kitchen, desk, wardrobe, and bathroom. I'm livin' like a king! All settled in... and livin' like a king! So far, I've had a great first week here in Great Northern, and I can't wait to see what new things I may see or people I might meet in Kerteminde. To work in Denmark, anyone from another country needs either a work visa or a residence/work permit. As I will be spending only three months overseas, I only need a temporary residence permit. For Americans, these are available only in major cities. Living in South Carolina, my best option for the mandatory visa appointment was the VFS Global office in New York City. VFS Global is worldwide company that does outsourcing and technology services for governments and diplomatic missions. In late March of 2018, I made the trip and found the VFS office on the 9th floor of a massive building along with many other companies. A single floor housed enough offices for several separate companies! A list of a bunch of different companies on the same floor of a single building! Office selfie! The visa agent lady ran away before I could catch her in the picture. I stayed the night in a hotel right in the middle of Manhattan. NYC is known as the city that never sleeps, and the name is very fitting. The streets run crazy with traffic every single hour of each day, and customers constantly run through shops on every block. Times Square was bumper to bumper and shoulder to shoulder. $170 hotel rooms are super tiny in Manhattan. The paperwork and appointment process for the permit were quite a hassle, but I had amazing help from Peter Kold and Line Trier, two of the management personnel for Great Northern Golf Club. Line and Peter provided all the necessary information I needed to make the process go as smoothly as possible. This was a great help for me, considering I was unfamiliar with the large city lifestyle. Line (pronounced like the American Lena) Trier, the backbone of Great Northerns management staff. My appointment was not what I expected. VFS personnel took my fingerprints and profile pictures for their databases and questioned me about why I wanted to travel to Denmark. After a long wait and enormous amounts of paperwork, I was finally approved by the Consulate General to stay in Denmark for the summer. This American is DK bound! With a few hours of free time before I had to head back home. I mapped out out a route around Manhattan to see as much as I could while I was there. I visited Trump Tower (my personal favorite), the Empire State Building, St. Patricks Cathedral, and Times Square. During my brief trip, I encountered people from various ethnic backgrounds and languages. This was a great eye-opener for me because I realized how much of a challenge my summer may be while living a different lifestyle and dealing with the language barrier between Danish and English. New York was quite the trip. I'm sad I only spent a day and a half there, but I'm glad I could adventure out into a different part of the country... while representing the one and only TurfNet! Southern boy off to Denmark! Welcome to the life of Parker Stancil! I am a 19-year-old turf student at Horry Georgetown Technical College in Myrtle Beach, SC. With the exception of living in Florida for one summer, South Carolina has been home to me for my entire life. I'm very proud to be southern, but this summer I'm going Danish! I am no stranger to golf course maintenance. Since the age of 16, I have volunteered at six professional golf tournaments and I've worked on four golf courses prior to this summer's TurfNet internship in Kerteminde, Denmark A month after I turned 16, I relocated to Lake Wales, FL to install an HDPE system at Mountain Lake Country Club before my junior year in high school. Working in Florida opened my eyes to a career path that I really enjoyed, so I continued working on golf courses every year after that. The next three courses were Grande Dunes Members Club, Secession Golf Club, and Myrtle Beach National, all in South Carolina. Just last week I volunteered for the Wells Fargo Championship at Quail Hollow in Charlotte, NC, stimping greens (above) and testing green firmness (below). I also volunteered this year at the Mitsubishi Electric Classic at TPC Sugarloaf in Georgia (below). After a quick one-day trip to New York City in late March to obtain my Danish work visa, on May 11th I flew from Washington, DC to Copenhagen to begin my internship at Great Northern Golf Club, a Jack Nicklaus design located in Kerteminde, Denmark. Kerteminde is about 80 miles west of Copenhagen via train and bus. My first step out of my comfort zone: a solo trip to NYC to obtain a Danish work visa. Other than a family trip to Mexico, this is my first experience out of the USA. Initially I was nervous to leave home, but my fellow crew members at Great Northern have been very welcoming. Some of the guys from Scotland drove me around to show me the town and give me a chance to buy groceries and other items to settle in. Aidan OHara, veteran golf course superintendent, runs the operations here at Great Northern. I'm very excited to absorb every bit of his experience and wisdom that I can. Aidan has told me how this summer is going to be focused on thatch control. Now in his fourth year here, he inherited an organic mat layer that was a few inches thick. We will be putting a lot of effort into removing this thatch layer from the A4 bentgrass greens. As the sun rises here at 5:00 each morning, the work begins early. Time to get going! Thatch attack! My first day at Great Northern was spent with the aeration crew. 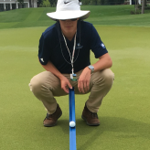 Editor's Note: Parker's internship this year is partially funded by a grant from the Turf and Ornamental Communicators Association (TOCA) and Bayer Crop Science. Parker wasn't able to attend the annual TOCA meeting in early May but sent along the following comments to thank TOCA, TurfNet and Bayer for their support. Parker Stancil's internship in Denmark is partially underwritten by a grant from the Turf and Ornamental Communicators Association and Bayer Crop Science.